are available at the Coffey County Hospital Gift Shop! 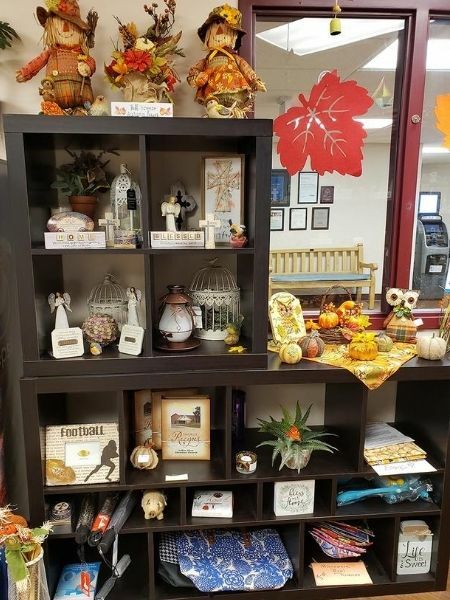 Through the hard work and efforts of dedicated volunteers, the Coffey County Hospital Gift Shop provides a valuable service to the hospital’s patients, visitors, and staff; but the giving does not stop there. All proceeds are then given back to the community through hospital improvements and local scholarships. The hospital's electronic sign and digital mammography unit and a Wii electronic game system at The Meadows are among the many purchases made, in whole or in part, with gift shop proceeds. The Auxiliary volunteers give of their time and talents every day to provide our patients and visitors with an outstanding gift shop, and then they use the proceeds for hospital enhancements and scholarships for deserving high school graduates. The auxiliary welcomes new volunteers for the gift shop, information desk, and other opportunities throughout Coffey Health System. If you have a few hours to spare, and would like a truly rewarding volunteer opportunity, stop by the gift shop and pick up an application today. for the convenience of patients, visitors, and employees.